A new review carried out by the organization GRAIN reveals that small farms produce most of the world’s food. However, they are currently squeezed onto less than a quarter of the world’s farmland. The world is fast losing farms and farmers through the concentration of land into the hands of the rich and powerful. If we do nothing to reverse this trend, the world will lose its capacity to feed itself. This claim is based on the findings of the report, ‘Hungry for Land’ (1), which states that small farmers are often much more productive than large corporate farms. For example, if all of Kenya’s farms matched the output of its small farms, the nation’s agricultural productivity would double. In Central America, it would nearly triple. In Russia, it would be six fold. Marina Dos Santos of the Coordination of the Brazilian Landless Movement (MST) states that the peasantry is currently being criminalised, taken to court and even made to disappear when it comes to the struggle for land. Small farmers are constantly exposed to systematic expulsion from their land, which not only affects peasants but also many other small farmers and indigenous peoples who are the target of foreign corporations. Dos Santos says that small farmers want land in order to live and to produce as these are their basic rights against land-grabbing corporations who seek only speculation and profit. If the current processes of land concentration continue, she argues that then no matter how hard-working, efficient and productive they are, small farmers will simply not be able to carry on. While it is often stated in official circles that the planet needs to produce more food to feed the growing population, the report suggests that more food could be produced almost immediately if small farmers had access to more land and could work in a supportive policy environment, rather than under the siege conditions they are facing today. Elizabeth Mpofu, General Coordinator of La Via Campesina, says that the vast majority of farms in Zimbabwebelong to smallholders and their average farm size has increased as a result of the Fast Track Land Reform Programme. Small farmers in the country now produce over 90% of diverse agricultural food crops, while they only provided 60-70% of the national food before land redistribution. Mpofu says that we need to urgently put land back in the hands of small farmers and make the struggle for genuine and comprehensive agrarian reform central to the fight for better food systems. The world is fast losing farms and farmers in many places, while big farms are getting bigger. One major reason why small farms are disappearing is the rapid growth of monoculture plantations. In the last 50 years, 140 million hectares — well more than all the farmland inChina — have been taken over for soybean, oil palm, rapeseed and sugar cane alone. By definition, peasant agriculture prioritises food production for local and national markets as well as for farmers’ own families. Big agritech corporations take over scarce fertile land and prioritise commodities or export crops for profit and markets far away that cater for the needs of the affluent. This process impoverishes local communities and brings about food insecurity (2). GRAIN’s Camila Montecinos concludes that the concentration of fertile agricultural land in fewer and fewer hands is directly related to the increasing number of people going hungry every day. GRAIN’s report relies on statistics that show small farms are technically more productive than big farms. While industrial farms have enormous power, influence and resources, small farms almost everywhere outperform big farms in terms of productivity. The review comes on the heels of a September 2013 report by the United Nations Conference on Trade and Development (3), which also stated that farming in rich and poor nations alike should shift from monoculture towards greater varieties of crops, reduced use of fertilisers and other inputs, greater support for small-scale farmers and more locally focused production and consumption of food. More than 60 international experts contributed to the report. The report stated that monoculture and industrial farming methods are not providing sufficient affordable food where it is needed. The system actually causes food poverty, not addresses it. Numerous high level reports from the UN and development agencies have argued in favour of small farmers and agro-ecology, but this has not been translated into real action on the ground where peasant farmers increasingly face marginalisation and oppression. Despite what these reports conclude and the evidence that indicates small farms have better productivity, Indiafor example is abandoning the small farmer in favour of foreign agritech corporations. This is resulting in a forced removal of farmers from the land and the destruction of traditional communities on a massive scale. In 2008, former Finance Minister P. Chidambaram envisaged at least 600 million people from rural Indiaeventually shifting to cities, leaving just 15% left to work the land or associated with the rural economy (4). This process is so severe, so shocking even, that environmentalist Vandana Shiva has called what is happening constitutes the biggest forced removal of people from their lands in history. According to a 2009 report commissioned by the rural development ministry and chaired by the then minister Raghuvansh Prasad Singh, in certain areas of India it also involves the biggest illegal land grab since Columbus(5). 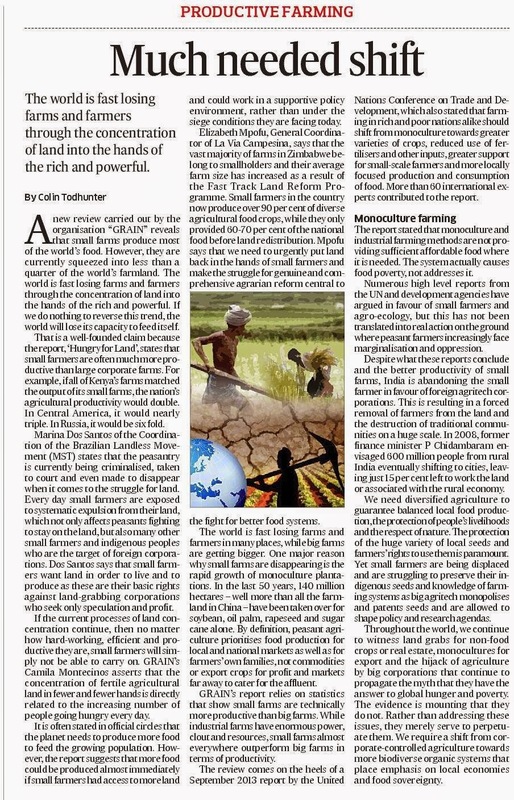 The trend in India, as elsewhere, is being driven by big agritech that is working with the government to ensure a shift away from diversified agriculture that guarantees balanced local food production, the protection of people’s livelihoods and environmental sustainability. Policies that allow for the protection of local seeds and farmers’ rights to use them are paramount. Yet small farmers are being displaced and are struggling to preserve their indigenous seeds and traditional knowledge of farming systems. By patenting and monopolising seeds, big agritech is preventing farmers from saving and exchanging their own seeds that were developed over thousands of years. Agritech corporations are being allowed to shape government policy by being granted a strategic role in trade negotiations (6). They are consequently setting the policy/knowledge framework by being allowed to fund and determine the nature of research carried out in public universities and institutes (7). Throughout the world, we continue to witness land grabs for non-food crops, industry or real estate interests, monocultures for export and the hijack of agriculture by big corporations backed by their co-opted scientists, media outlets and politicians (8) who continue to propagate the myth that they have the answer to global hunger and poverty. Despite mounting evidence that they do not, they continue to colonise agriculture all over the world – look no further than Africa where the Gates Foundation, Monsanto and Western governments are placing it in the hands of big agritech for private profit under the old colonialist pretext of helping the poor (9). A shift from corporate-controlled, profit oriented commodity agriculture is required and involves moving towards more biodiverse organic systems that place emphasis on small farmers, local economies and food sovereignty. Rather than addressing poverty, food inequality and hunger, big agritech corporations merely serve to perpetuate these problems and exploitative global power relations by sucking power, wealth and food from poorer countries, small farmers and local communities to satisfy themselves, their shareholders and affluent urban consumers in foreign lands. As long as petro-chemical corporate agriculture predominates and is expanded throughout the planet, the less food security and local/national food sovereignty we will see – and the more wars fuelled by oil interests, conflicts over land and water and damage to the environment we shall witness.